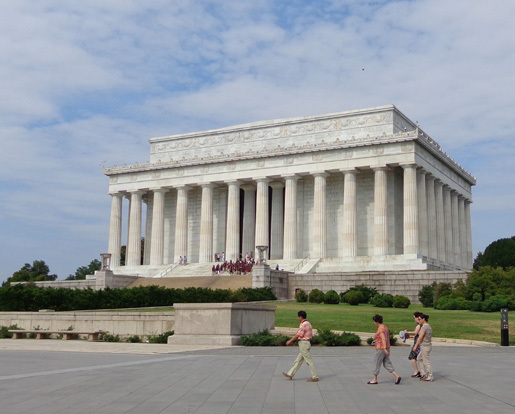 Our 15-day visit to the Washington, DC area included revisiting some of the iconic tourist stops we've seen on previous trips plus touring some places new to us like Mt. Vernon and the U.S. Capitol Building. I'd like to think we acquired more knowledge and wisdom from what we learned and observed. We appreciate culture and history so much more now than we did when we were school kids. 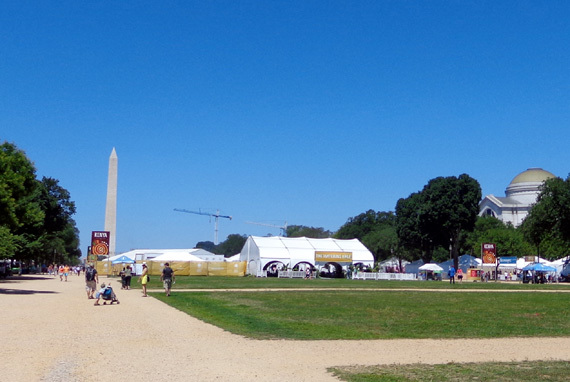 In this entry I'll show photos from some of the museums, memorials, monuments, and the annual Smithsonian Folklife Festival along the National Mall. 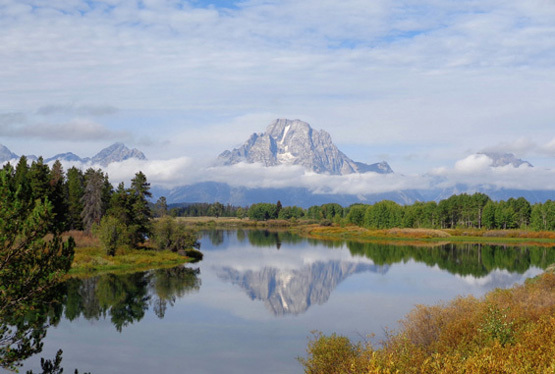 I have so many pictures I want to show you from the U.S. Botanical Gardens, Mt. Vernon, and a personal tour of the U.S. Capitol with one of our Representative's staff members that I'll make separate entries for those places. Washington, D.C. has shopping malls, of course, but it is world famous for the National Mall, a beautiful two-mile-long green space surrounded on both sides by stately Smithsonian Institution museums and galleries and on the ends by the formidable U.S. Capitol Building and the Lincoln Memorial. West of center is the iconic Washington Monument. 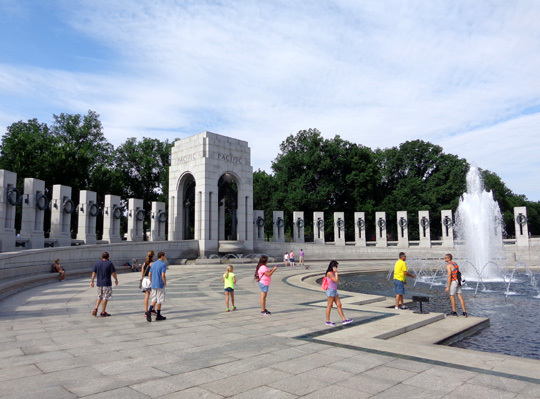 Protected and managed by the National Park Service, the full name of this symbol of our country's freedom is the National Mall and Memorial Parks. 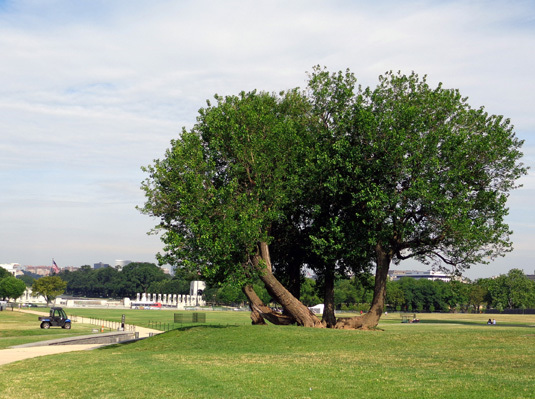 Here is a teensy map of the very long National Mall; you can find a readable map at the site above. 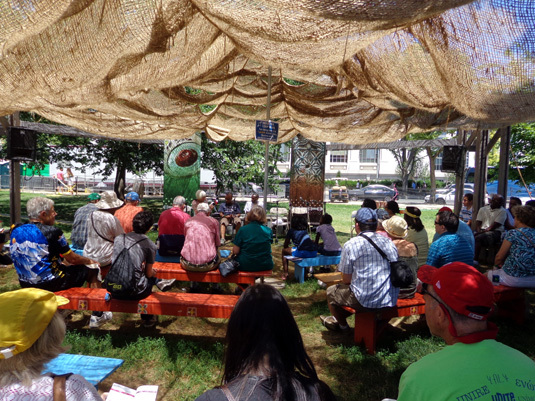 The Mall is a wonderful gathering space for people from all over the world, particularly when part of the grassy areas aren't fenced off like they were in the days leading up to the Fourth of July. One day we sat in the shade of that tree to eat our lunch. Kids love to climb on the low branches. 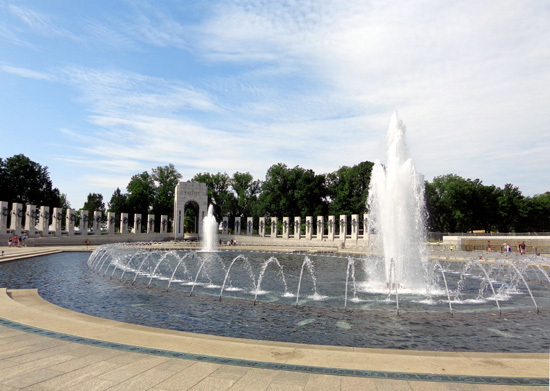 The WWII memorial is in the background. 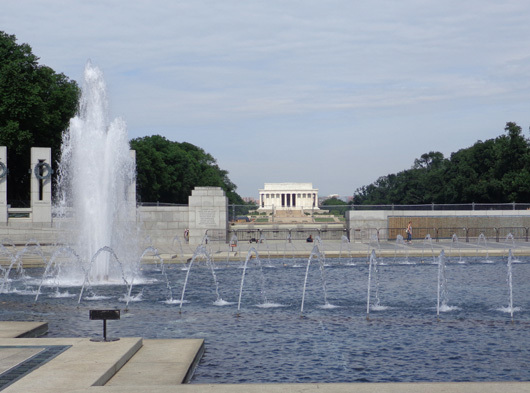 Within the green spaces are scenic water features like duck ponds and the reflecting pools in front of the Lincoln Memorial and U.S. Capitol Building. 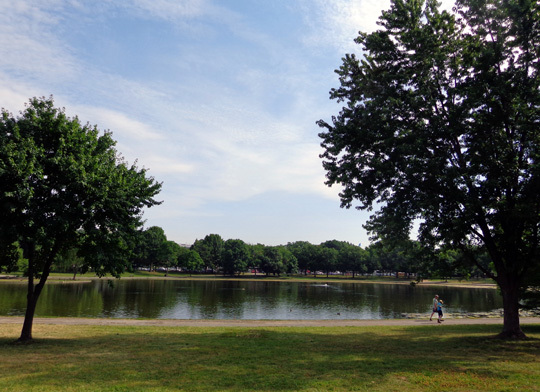 People love to walk, run, and cycle on the paved paths and streets in and next to the Mall area. 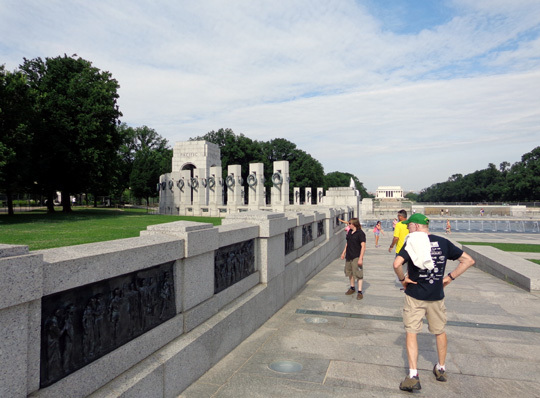 If you want to see all the buildings and memorials in one day it's at least a four-mile walk to do a complete rectangle around the perimeter of the National Mall. That doesn't include going into any of the buildings. Be prepared with comfortable shoes and plenty of fluids to drink, especially in the heat of the summer. Better yet, take several days to explore the area. 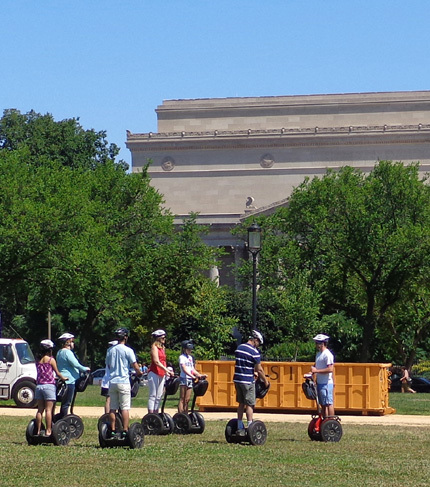 Regardless of how much time you take, if you can't walk far enough to see everything you want to see you can rent a Segway or bicycle, ride a horse-drawn carriage, or take a bus tour. before venturing out to explore the National Mall. 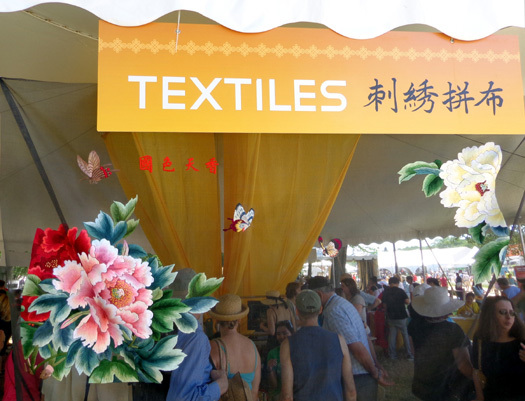 One of the activities we enjoyed on the Mall was the 48th annual Smithsonian Institute Folklife Festival, which ran for several days before and after July 4. Several acres in the middle of The Mall were covered in tents, food booths, and displays. to the right is the dome of the very popular Natural History Museum. 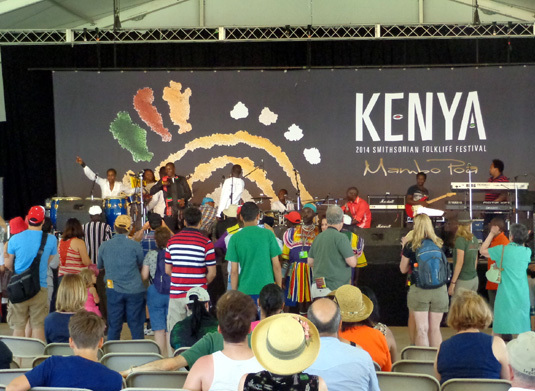 This year's festival featured the cultures of China and Kenya. 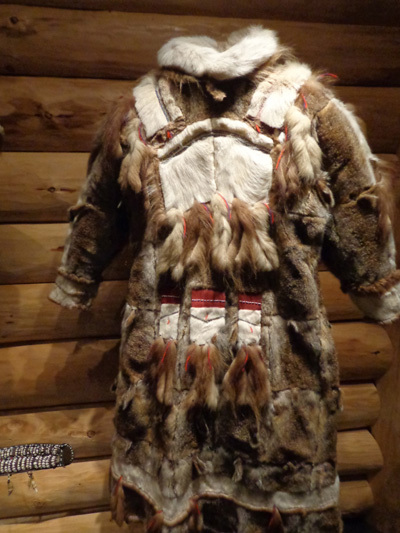 Each country had stages with a succession of different performances that continued throughout the day (all free), interpretive programs like story-telling, food booths, and demonstrations of native crafts. 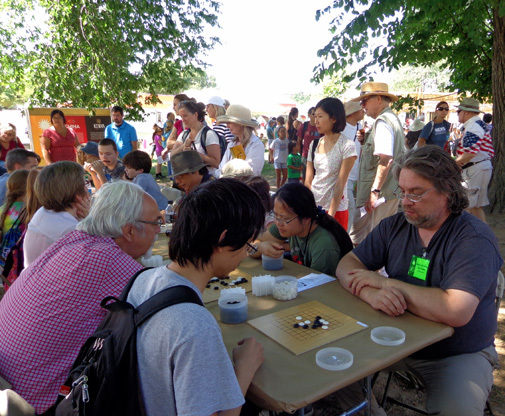 We enjoyed tasting authentic foods and beverages from both countries, listening to native music and dancing, and watching artisans making traditional arts and crafts. 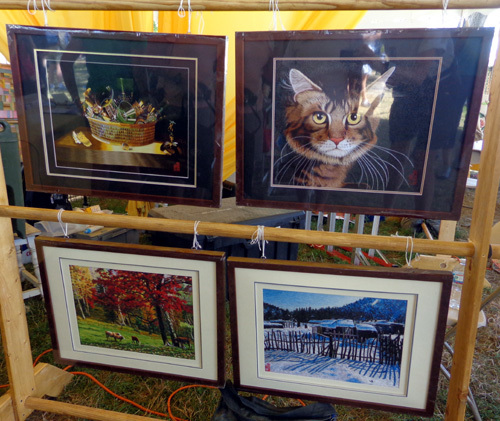 The designs in the photo above looked like photos or paintings from a few feet away, not embroidery. 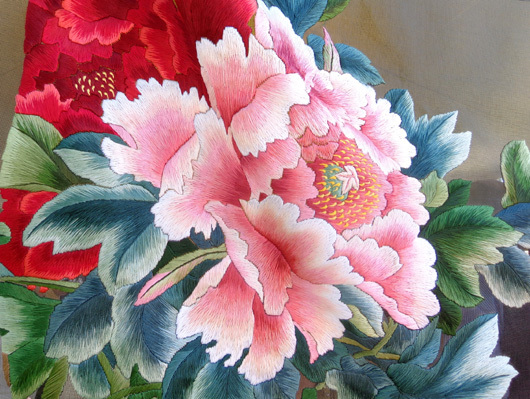 The beautiful textile and other craft demonstrations remind me of all the unfinished projects that are sitting in our storage unit, including an intricate, half-completed, miniature embroidered silk Chinese-patterned rug I started when my eyes and fingers were much younger. The Chinese woman demonstrating the craft in the festival looked even older than me, so maybe I'll be able to finish my small project some day! 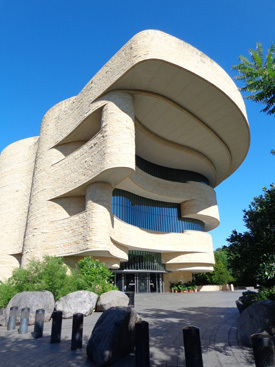 Founded in 1846, the Smithsonian is the world's largest museum and research complex, with nineteen museums and galleries, the National Zoological Park, and nine research facilities. The institution's mission is to preserve our nation's heritage, discover new knowledge, and share our resources with the rest of the world. That's a lofty goal -- and it does it quite well. If we lived anywhere near Washington, D.C., this is an organization we'd be thrilled to volunteer for. 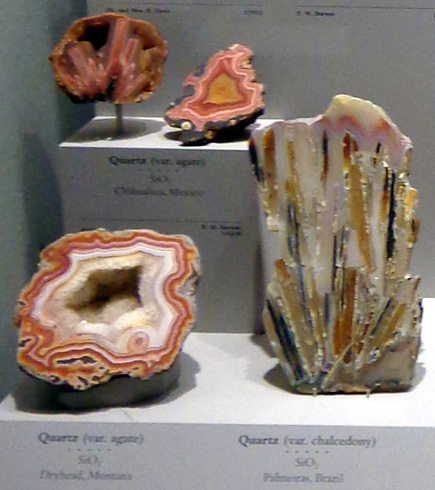 Smithsonian museum. We've seen it several times and didn't go in this time. 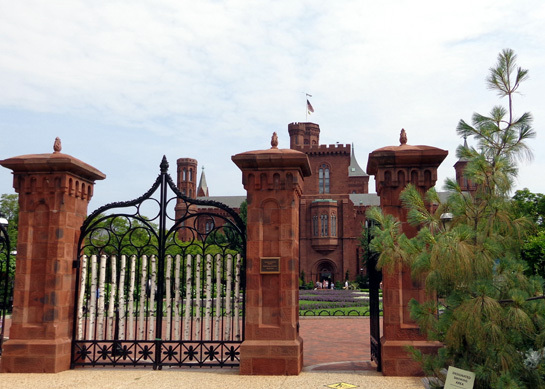 What's most astonishing to me is that U.S. citizens and visitors from any other country can get into most of the Smithsonian's museums for free. And a lot of foreign visitors do visit these museums. 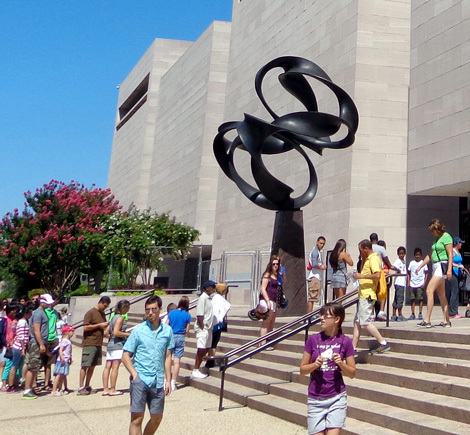 I think every person in the USA should visit as many of the museums and galleries as possible during their lives. There is so much to learn and observe. Local kids are lucky they can go there on school trips. 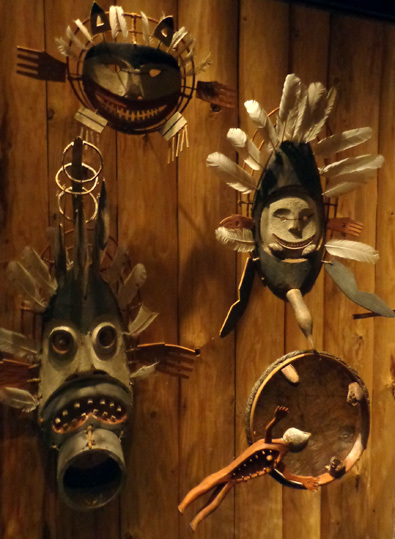 Jim and I have been in several of the museums, some more than once, and we've barely scratched the surface of all there is to see in them. 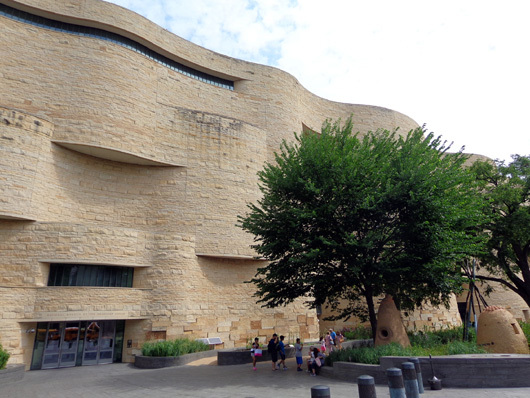 On this trip we visited the relatively new American Indian Museum, which opened after our last visit to the city in 2005, and the iconic American Natural History Museum, which we've visited on all of our previous trips to Washington, DC. 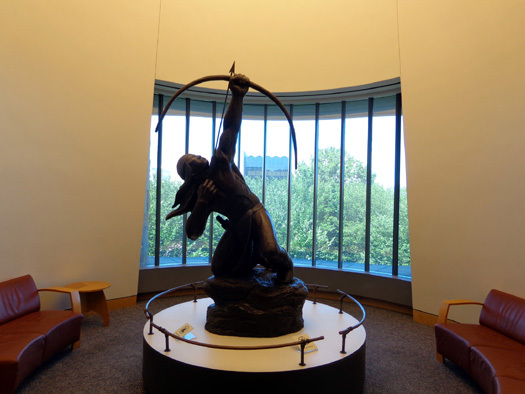 We were inside the American Indian Museum twice in early July. 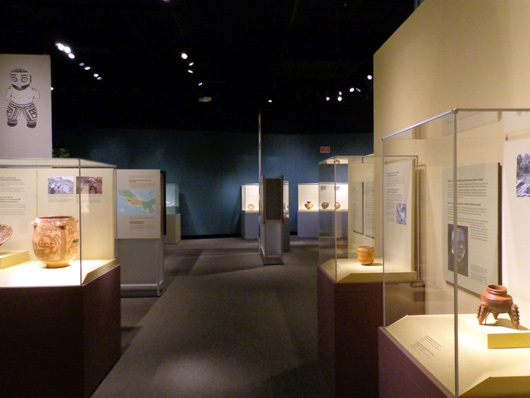 It wasn't crowded either time, so we could leisurely look at the exhibits. 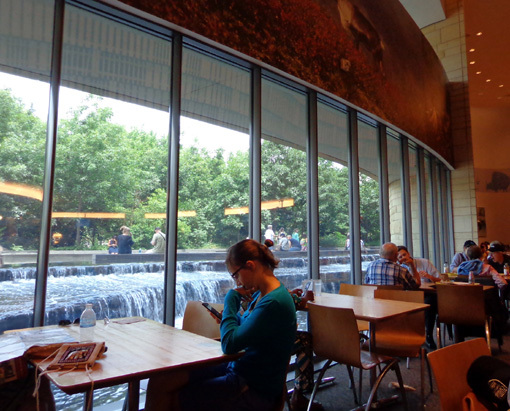 We heard that the ethnic food in its cafe was very good so we had lunch there one weekday. There was a good selection of soups, salads, entrees, and desserts from both North and South American Indian cultures. The prices were moderate and the food was delicious. 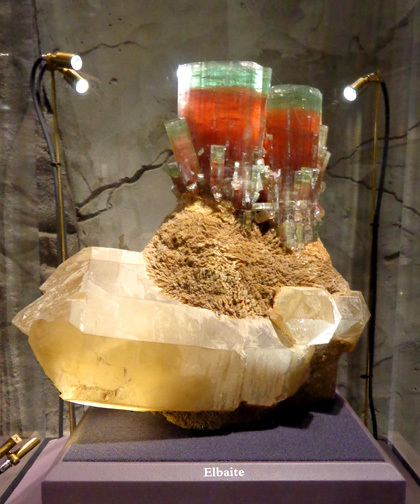 We made a mistake going into the Natural History Museum on July 5. 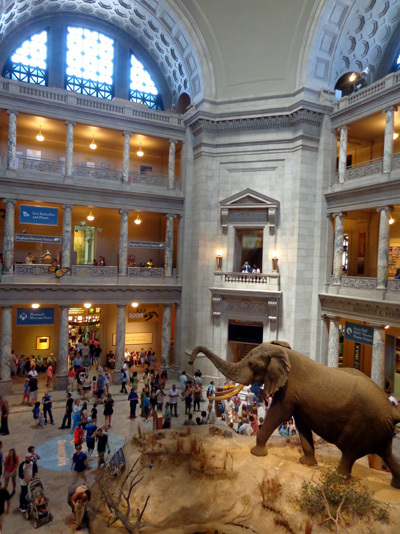 It was terribly crowded during this holiday weekend and we had some difficulty moving around and looking at the exhibits in which we were most interested. 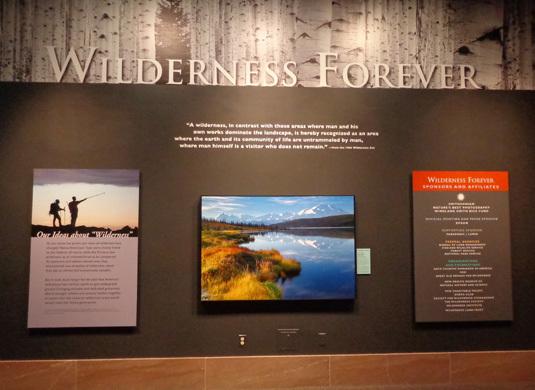 It shouldn't surprise anyone that one of my favorite rooms in this museum has walls full of gorgeous wilderness photos, many from Alaska. This area as so crowded, however, that it was difficult to see many of the displays and impossible to get close enough to the Hope Diamond to photograph it. We have to return to D.C. to get the van in the fall. 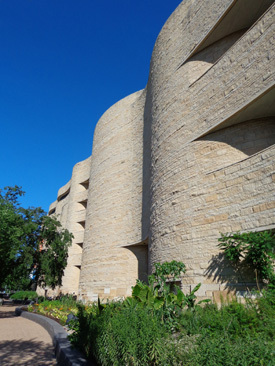 If we stay in the area long enough we plan to come back to this and maybe some other Smithsonian museums on a weekday when there aren't so many other visitors. Kids will be in school then. 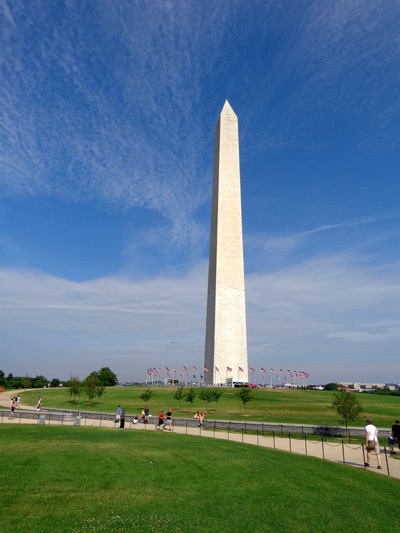 The monument was damaged in an earthquake a couple years ago but has been repaired and reopened. Tickets are required to tour the inside of the monument. Neither of us has ever been inside. You can reserve tickets in advance for a fee, or stand outside several hours for free, same-day tickets . . . and hope you can get in that day. We still haven't been inside. By the time we called to reserve advance tickets, the reserve-able spots were sold out. It was too hot the two days we were at the National Mall to wait outside and maybe not even get to go in. We may try again in the fall. In case you're wondering, George Washington is buried on the grounds of his home, Mt. Vernon, not the Washington Monument. Nor is Abraham Lincoln buried at his majestic memorial at the far west end of the National Mall; he was buried in his hometown of Springfield, IL. 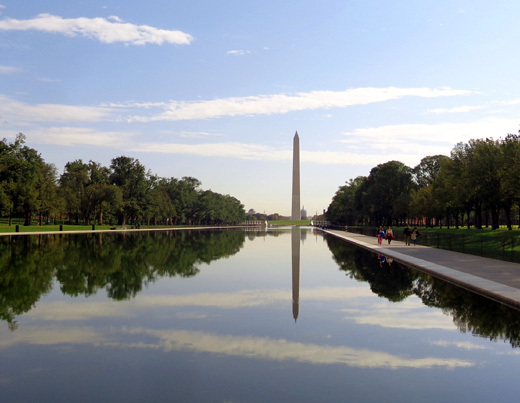 There is a very long reflecting pool in front of the Lincoln Memorial. It's shown two photos up. 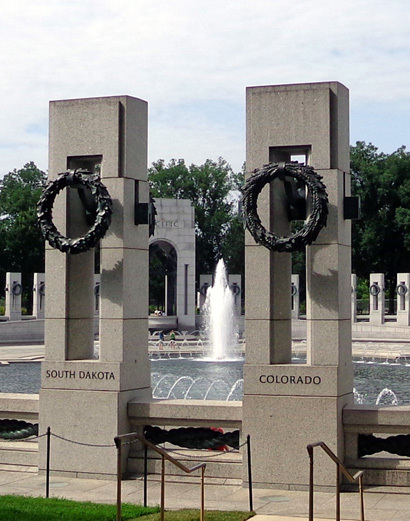 This memorial located near the Lincoln Memorial honors the men and women who served in the Vietnam War. 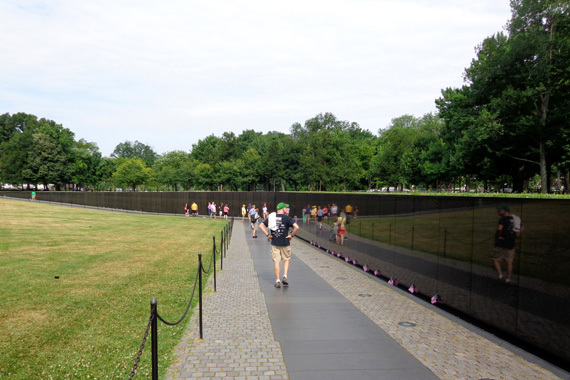 In addition to statues and informative panels about the war, a long black marble wall contains the names of more than 58,000 Americans who lost their lives during the conflict. The names are listed chronologically based on when they died. There is an index of names so visitors can find the panels they are looking for. 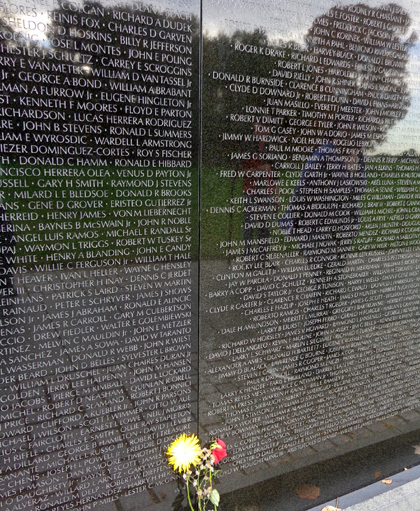 Jim was in Vietnam for a year (mostly during 1968) and has located some of the names of fallen soldiers in his unit. He is always understandably quiet when visiting this monument. It's sobering to walk by so many, many names and know these are real people who lost their lives in this controversial conflict. I am totally impressed with this relatively new and very large memorial honoring the servicemen and women who served in WWII. The Lincoln Memorial is in the background. 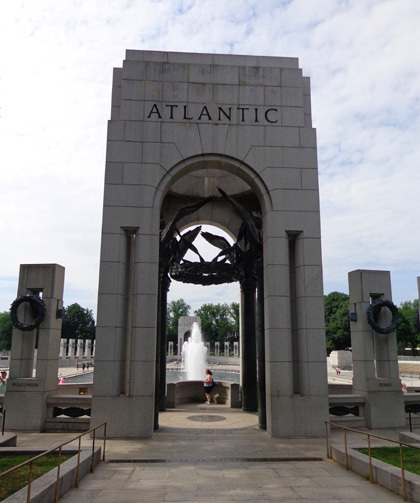 Even though I've seen the WWII memorial before I love walking through it. It just makes me proud to be an American, as do the other memorials and monuments around the National Mall.